Jadon Sancho has been bombarded by ticket requests from family and friends for his London return on Wednesday when Borussia Dortmund face Tottenham Hotspur at Wembley in the Champions League. The 18-year-old England winger says he has requested "about 30 tickets" from his German club for the plum last 16, first leg tie in his home city. "Everyone was messaging me saying, 'I need a ticket! It's big. I'll be playing in front of my family, which is something I've always wanted to do since I was a young boy. "It's Wembley. I can't wait." As he has done all season, Sancho shone on Saturday, scoring the opening goal and setting up his side's other two in a 3-3 draw for the Bundesliga leaders at home to Hoffenheim. 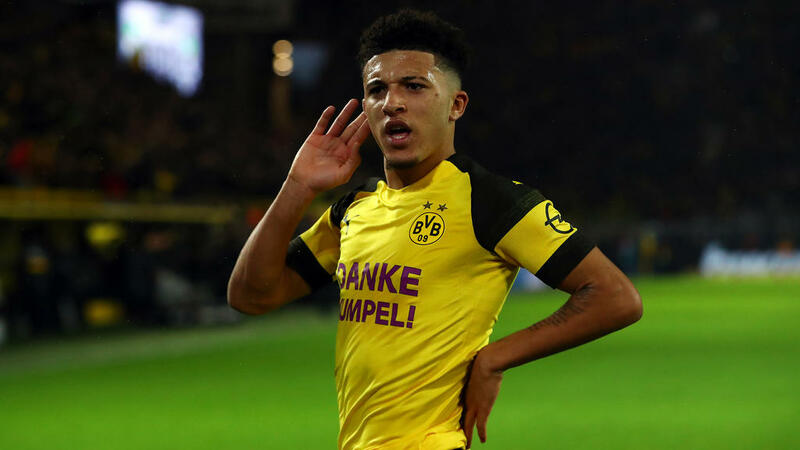 The match against Spurs on Wembley's hallowed turf is a homecoming for Sancho, one of the stars of an impressive Dortmund team seeking to dethrone Bayern Munich this season. Ahead of the match, he has been exchanging banter with Spurs' 23-year-old midfielder Harry Winks. "I'm good friends with Harry. Obviously he feels they're going to win. We feel we're going to win," said Sancho with a smile. Sancho learned his trade on the streets of Kennington in south London. "I think it's how we were brought up from the start - it's street football," he said. "Everyone just expresses themselves, you fear no one because you have nothing to lose and you are just being yourself." Sancho joined Watford's youth set-up aged seven, but left home aged just 11 to board at the club's Harefield Academy when travelling across London became an issue. His performances attracted Premier League giants Manchester City in March 2015. He caught the eye of City manager Pep Guardiola with 12 goals, creating four more, in 14 games for City's Under-18 Premier League team in 2016/17. However, Sancho was dropped from the senior squad in July 2017 after refusing to sign a new contract due to a lack of assurances over playing time. Dortmund stepped in and Sancho signed a five-year deal. He is clear about why he joined the Bundesliga giants. "It was about the youngsters here getting opportunities," he added after starting 14 of 21 league games this season. "I couldn't thank them more." He admits struggling to learn German and being so far from home can be tough. "It hasn't been easy. I've had to work for this," he said. "German will be always kind of hard to me and you learn new things every day, but I am getting the basics right. "I know what the manager is saying in training sessions, which makes it easier. "I think me being so comfortable being abroad is due to the fact I've always been away from home since I was young. "I always loved football, so chose the hard option. I'm just happy that's it's all working out." But Sancho has not forgotten his tough south London roots. "I know what it is like growing up in that area. "I don't want to go into details, but it's not nice, especially when you have people around you doing bad things. "I hope I can give a positive message for the kids in south London - don't do those bad things. "You don't have to be footballers. You could focus on your school work. "Education is the most important thing and I am lucky enough that I had the opportunity to go to Harefield. "I wanted to stay at home and travel, but the people around me told me what was best. "I listened to them and I am happy that I am where I am, here today." Out of sight does not mean Sancho is out of mind for England manager Gareth Southgate. "Last time I spoke to Gareth was when I left, but (England assistant coach) Steve Holland came over recently and told me what the plan was with the Nations League coming up," said Sancho. Having made his England debut in October as a substitute in the goalless draw against Croatia, he'll no doubt soon be swapping Dortmund's yellow and black for the white of the Three Lions.